RealVideo is a suite of proprietary video compression formats developed by RealNetworks – the specific format changes with the version. RealVideo is usually paired with RealAudio and packaged in a RealMedia (.rm) container. RealMedia is suitable for use as a streaming media format, that is one which is viewed while it is being sent over the network. Streaming video can be used to watch live television, since it does not require downloading the entire video in advance. Compression and decompression software for each version are called “codecs”. How to Open and Play RealVideo File? Though RealVideo can be played in RealPlayer, it cannot be converted in the built-in RealTimes Converter. What if for specific use, you need to convert RealVideo to popular video format MP4, MOV, AVI, WMV, MPG, MKV, FLV, VOB, etc. or audio format MP3, AAC, OGG, AC3, WAV, WMA, etc. In this article, UFUShare introduces an easy-to-use RealVideo Converter and a step-by-step guide to help you convert RealVideo to any popular video and audio formats. 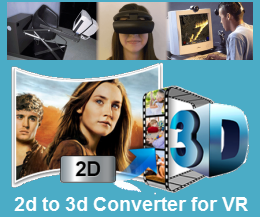 RealVideo Converter is versatile RealMedia converter to convert RealVideo and RealAudio media file to various video formats as well as to convert any video to video and audio playable with RealPlayer for play and enjoy on RealPlayer. RealVideo Converter is outstanding RealPlayer file converter that is capable of converting RealPlayer file in RM, RMVB, RV, RAM, IVR, and RA. It can fast convert RealVideo to AVI, MP4, MOV, 3GP, FLV, H.264, HD, MKV, WMV, VOB, Xvid, DivX, RAD, BIK, WebM, etc and convert Real video and RealAudio to MP3, OGG, AAC, AC3, WAV, WMA, etc. RealVideo Converter is also known as excellent RealVideo to AVI Converter, RealVideo to WMV Converter. What’s more, RealVideo Converter is powered with a smart video editor which allows you to trim, crop, merge videos/audio,adjust the parameters, video effects to customize output effect, capture pictures, add adjust subtitles, watermark and more. RealVideo Converter for Windows supports Windows 10, Windows 8, Windows 7, Windows Vista and Windows XP. RealVideo Converter for Mac is fully compatible with maOS 10.12 Sierra, OS X 10.11 El Capitan, 10.10 Yosemite, 10.9 Mavericks, 10.8 Mountain lion, 10.7 Lion, 10.6 Snow Leopard. How to Convert RealVideo to MP4, MKV, AVI, WMV, MP3, WMA, etc. with RV Converter? Download RealVideo Converter – Total Video Converter (For Windows, For Mac). Install and launch the program. Locate your RealVideo files. Drag and drop your RealVideo files to program interface. Click “Profile” Drop-down. Choose your desired video format from the profiles list. Take converting RealVideo to MP4 for example. 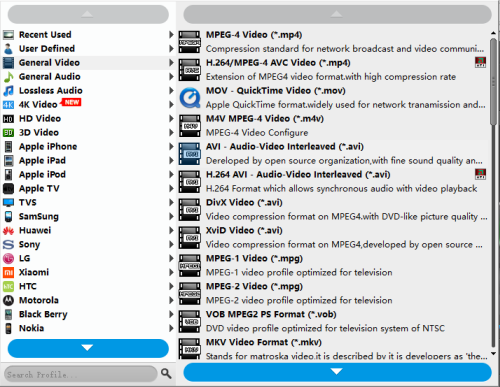 Choose “MPEG4 Video(*.mp4)” as output video format from “General Video” Category. 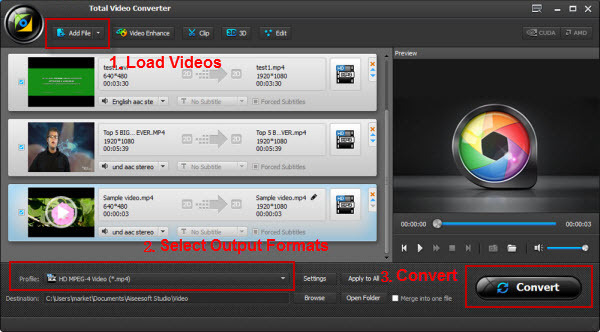 Click “Convert” button to start RealVideo to MP4, MOV, AVI, WMV, MPG, MKV, FLV, VOB, MP3, AAC, etc conversion. How do I retrieve lost contacts from Samsung Galaxy J7 Pro?